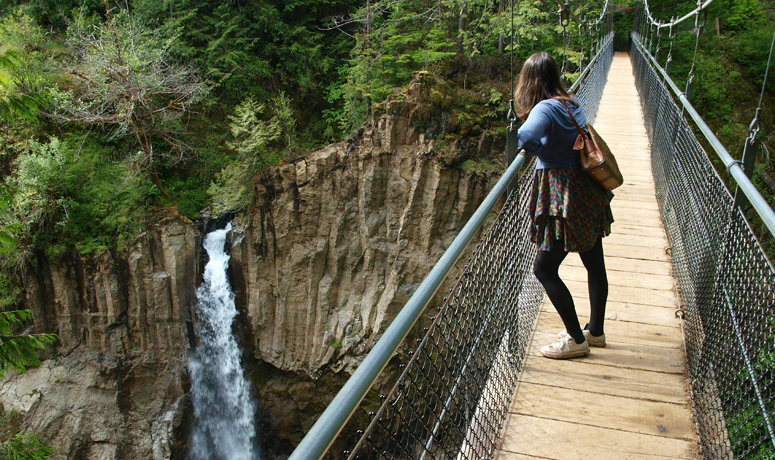 Surf, waterfalls and pixies await. 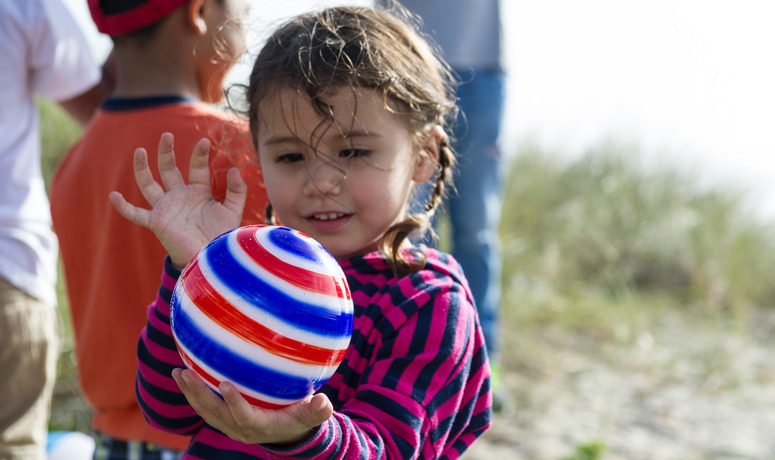 Discover Lincoln City’s seven miles of beach and find your smile. Ocean breezes, rhythmic waves and miles of sandy beach to explore. Book your getaway today! From salt-water taffy to kite-flying to fresh seafood chowder, Lincoln City has long been a top family spot for old-fashioned fun on the Oregon Coast for generations. But there are lots of surprises along this inviting stretch of beach town on the Central Coast that you may not have discovered. 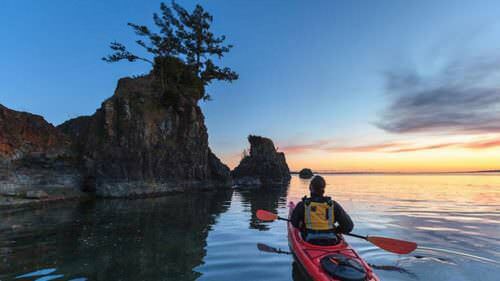 Lincoln City follows Highway 101 for seven miles, with delights to be found from the high cliffs of Cascade Head to the tranquil waters of Siletz Bay. On your next visit, find delight in a new spot to hike, paddle, dine and stroll: Here are some of the secrets Lincoln City has been keeping. 1. You can channel your inner Dale Chihuly. 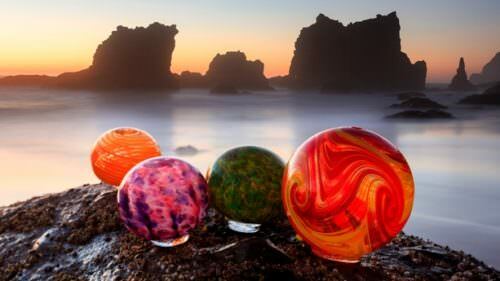 You may be familiar with Lincoln City’s Finders Keepers program, which magically drops hundreds of handmade glass floats on the shore for lucky beach walkers to find. But there’s no need to be disappointed if you don’t find one. Head over to Jennifer Sears Art Gallery in the Taft District and make your own glass float or a beautiful bowl or paperweight with help from a local artist. You can also watch a live glass blowing demonstration, a fiery and fascinating process that will make your treasure all the more special. 2. This lake will be your new favorite retreat. You could visit Lincoln City dozens of times and not notice Devil’s Lake State Recreation Area, a friendly retreat just off the beaten path from the hubbub of Highway 101. Sheltered from the coastal winds, visitors ski, boat, fish and swim in the broad, shallow waters. Just watch out, if you’re superstitious — the lake’s name comes from a Native American legend that speaks of a giant creature that inhabits the waters. 3. 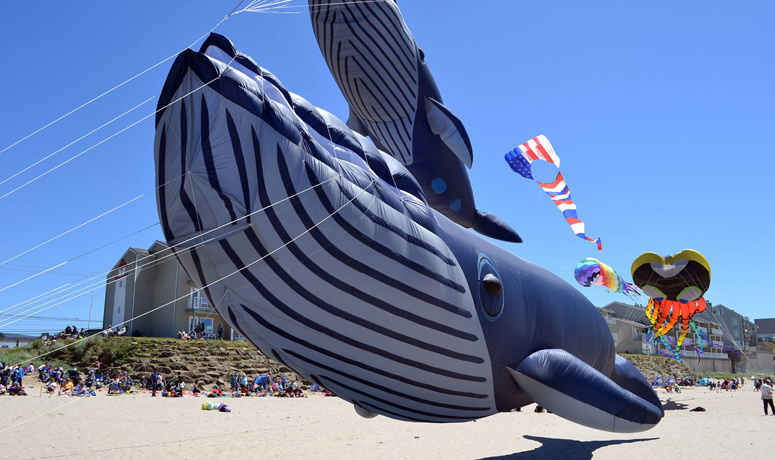 These two kite festivals will blow you away. Once named the kite-flying capital of the United States, this city has not one annual kite festival but two. Each summer and fall, giant, colorful shapes adorn the skies of the D River Wayside. Come for the Summer Kite Festival (June 23-24, 2018) or Fall Kite Festival (Oct. 6-7, 2018) and feel what it’s like to be a kid again. Gear up at Northwest Winds Kites & Toys, then come down and watch the pros demonstrate their latest routines and challenge yourself to learn a few tricks. 4. A one-eyed sea lion once roamed these streets. Back in the 1930s, Lincoln City’s first major tourist attraction was a sea lion named Joe. A local by the name of Dave Dewey found him on the beach, injured with just one eye, took it home and kept it as a pet. But Joe was a sneaky devil and would often troll the neighborhood for a seafood snack. He loved getting his back washed and his photo taken. Today, you can pose with a life-sized statue of Joe the sea lion at Lincoln City’s Southwest 35th Street beach access, then comb the beach for gems — on a good day you can find an assortment of agates, fossils, gemstones, shells, petrified wood, jasper, amber, rocks and minerals. Maybe even a glass float! 5. An Indiana Jones-like suspension bridge awaits. One of the prettiest hikes you’ll find on the Central Coast is to Drift Creek Falls, which begins 13 miles west of Siletz Bay in the lush Siuslaw National Forest. 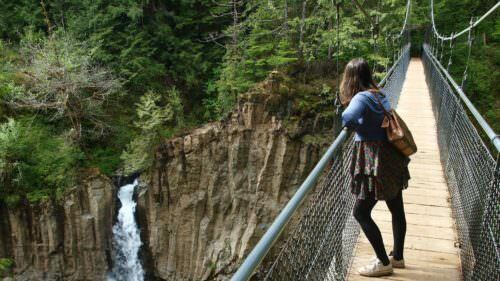 The 75-foot falls is gorgeous, but for the kid in all of us, the highlight is the suspension bridge over Drift Creek on the way there. At 240-feet across, the cable suspension bridge is anchored to two bluffs, can hold more than 150,000 pounds and offers a birds-eye view of the falls. 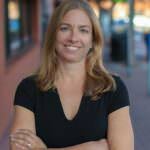 The 3-mile-round-trip hike is moderately difficult, for older children and adventurous hikers. A $5 Recreation Pass is required at the trailhead. 6. You may still find pixie dust here. Nearby Otis (3 miles north of Lincoln City) was once home to a Disney-esque amusement park called Pixieland, which Oregon Governor Tom McCall dedicated in 1969. The fairytale-themed park featured a steam locomotive, a log flume ride and an opera house. The park closed in 1974, but you can see the remnants today at a tide-gate house with a pink painted roof. Visitors to the North Lincoln County Historical Museum can also see historic photos and wax nostalgic over Pixie Kitchen, the now-retro cool restaurant inspired by the park. Every summer, Pixiefest, a festival paying homage to Lincoln City’s pixies, delights guests with family fun and memories of a cherished history. For more old-time charm, stop by for smoked salmon and fresh halibut fish n’ chips at Barnacle Bill’s, an beloved icon in the city since 1947. 7. Follow the rare flowers on your next nature walk. 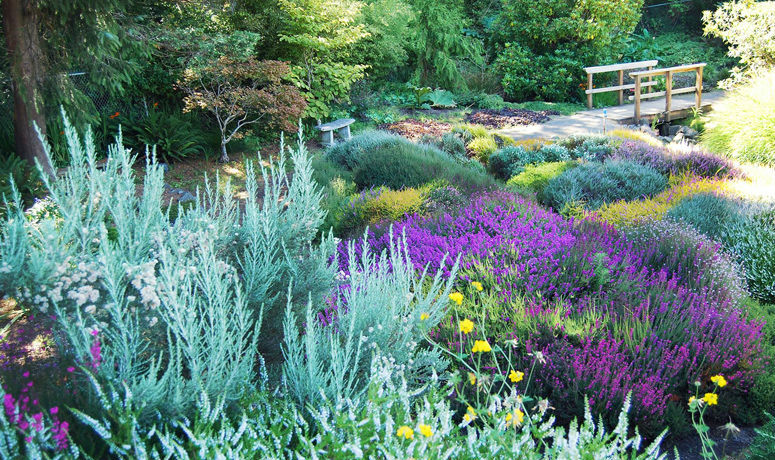 The Connie Hansen Garden Conservancy is a Lincoln City hidden gem in itself — a small, community garden run by volunteers. The gem within the gem is the marvelous Japanese iris growing onsite. Cultivated in Japan for more than 500 years and once restricted to enjoyment by royalty only, today the flower is still far less common than the bearded iris. Take a nature walk in the garden in the spring and early summer to see this unique flower in bloom. The garden is more than an acre in size, and its many paths also reveal blooming shrubs, hundreds of rhododendrons and flowering trees. 8. Feasting is encouraged here. There are too many spectacular restaurants in Oregon to count, but according to industry rankings, three are deserving of AAA’s Four Diamond Award — offering “creative preparations, skillfully served, often with wine steward, amid upscale ambience” — and one of them is in Lincoln City. The Bay House is definitely a special occasion or date night restaurant, with a spectacular view of Siletz Bay and eclectic seafood cuisine from award-winning Chef Kevin Ryan. Try the sea scallops, the Muscovy duck or the crab cakes. 9. Catch these gnarly waves, or watch the pros do it. 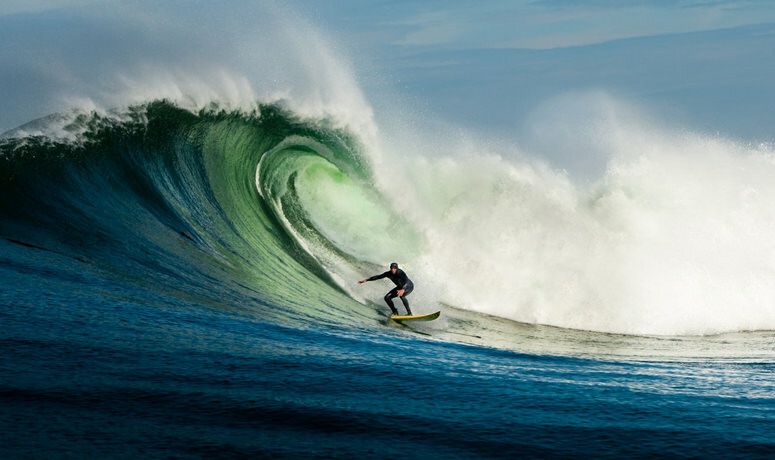 For die-hard, big-time surfers, Nelscott Reef offshore from Lincoln City is the stuff of legends. It’s one of a handful of waves around the world that’s rarely seen, but when the conditions are right, it draws out the pros and spectators alike. The wave is so unpredictable that surfers usually only have a few days notice to ride waves as high as 40 or 50 feet. Nelscott is only for the true experts; for surfing options for us mere mortals, stop in at Lincoln City Surf Shop for lessons and gear rentals, and try the waves at Road’s End on Lincoln City’s north end. 10. You can sleep like a queen. Whether it’s a rustic campground, budget-friendly motel, luxury oceanfront hotel or cozy B&B, you won’t have trouble finding a place to stay here. Lincoln City is chock full of superb lodging options, much of it kid- and pet-friendly, within walking distance to shops, restaurants and the beach. Check out Shearwater Inn, just north of D River Wayside, with its ocean views, fireplaces, hot tubs and daily wine socials; newly updated Coho Oceanfront Lodge; and Devils Lake RV Park — across from Blue Heron Landing, where visitors can easily explore the waters of Devils Lake. For more listings, see Lincoln City’s lodging page.